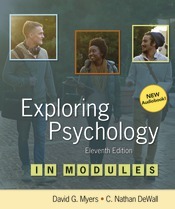 The best-selling Exploring Psychology and Exploring Psychology in Modules have long been the gold standard for Introductory Psychology instructors and students. Now in the Eleventh Edition, this standard continues with the creation of our first audiobook. The authors have received many requests for audiobook versions over the years for busy students who are working, commuting, etc., and for the many students who prefer to read and study this way. With the beautiful writing in Exploring Psychology, this was the perfect audiobook candidate! This audiobook is the first of its kind. This is not a screen reader reading the book. We worked with our Macmillan trade division to create the highest quality audiobook. David Myers and Nathan DeWall recorded the chapter openers so students can hear from their textbook authors. The rest of the book is narrated by a professional audiobook narrator. All of the chapters AND the content-containing appendices(3) AND the Time Management Student Preface have been recorded. Some of the content has been modified to work in the audio format--for example key info and fun stories from photo captions have been worked into the narrative, along with the best and most important of the marginal notes and quotes. Tables have been rewritten for the conversational presentation. A PDF of the historical timeline, key images, and research citations is also included. The audiobook, embedded in the e-book, is available, at no additional cost, in LaunchPad. The audiobook, for each chapter, is broken down into “modules” for ease of listening. Students have to be online and logged into LaunchPad to listen to the audiobook. Students may want to read some text material on paper or in the e-book in LaunchPad, and listen to other material via the audiobook. Our affordable solutions give students options. The audiobook is even available via Audible, Google, and iTunes. This audiobook is designed to give your students another avenue to fully experiencing this best-selling textbook and understanding these important concepts. We hope this is a valuable resource for you and your students!